Howard Arman conducts the Bavarian Radio Chorus and the Akademie für Alte Musik Berlin as well as english speaking soloists at the concert in the Herkulessaal, Munich, on 11th February 2017. This concert recording is the world's first recording of the "Occasional Oratorio" according to the historically researched and edited score of the Neue Hallische Handel edition. 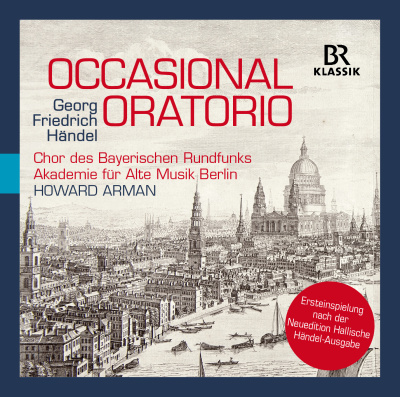 London, 1746: it was in an age of personal and political upheaval that Handel composed his “Occasional Oratorio”. As with his attempts to be an opera entrepreneur many years beforehand, he had also failed as an organizer of his own oratorio performances. When King George II, who had granted him a generous pension, was subjected to political and military pressure because of the Jacobites, Handel’s existence was placed in real danger. He duly took advantage of this “occasion” to lend musical support to the Regent, and to London’s anxious population. Within a very short time, on February 14, 1746, the carefully-crafted “Occasional Oratorio” premiered in London. Handel made generous use of much of his own earlier material, and this resulted in something resembling an anthology – a choice collection of his most beautiful and most famous pieces, or “greatest hits”. The “Messiah” librettist Charles Jennens complained loudly that the oratorio was “a triumph for a victory not yet gain’d”, and that its libretto, by a certain Newburgh Hamilton, was an “inconceivable jumble of John Milton and Edmund Spenser”. Nevertheless, the “Occasional Oratorio” offers the modern listener magnificent and largely familiar melodies, highly virtuosic baroque arias, deeply moving choruses and, above all, a magnificent Late Baroque sound that, in this extremely compact score, is quite unique. Audiences at the time probably considered this to be “Handel at his best”, and today’s public doubtlessly shares that opinion. This virtuoso and colourful interpretation, recorded recently on February 11, 2017 in the Herkulessaal of the Munich Residenz, was an exemplary success, delighting the audience and the trade press alike. Howard Arman conducted the Bavarian Radio Chorus, the Akademie für Alte Music Berlin with its historically informed performance practice, and a line-up of highly talented English soloists.